This very high quality, dual-speed Crayford focuser for refractor telescopes from Guan Sheng Optical (GSO) is beautifully machined and a joy to use. You will wonder how you ever lived without it once you install it! CNC machined from aluminum and anodized black, this focuser comes with a base plate adapter to attach to refractor telescopes. The inner drawtube glides on 4 precision bearings and a roller shaft and provides 79mm (3.11") of focus travel. The inner barrel is baffled and painted a flat black to minimize reflections for maximum contrast. The 2" focuser barrel features a brass compression ring so your eyepieces and other accessories will not be marred by the set-screw. Also included is a 1.25"-2" adapter with brass compression rings that is threaded to accept standard 2" filters. The inner draw-tube barrel is anodized black and features a laser-etched scale. The focuser has two large thumbscrews on the underside. The thumbscrew on the telescope side can be used to lock the focuser, allowing the use of heavy accessories or cameras without fear or slippage or losing focus. The other thumbscrew on the eyepiece end can be used to adjust the tension of the focuser to achieve a focusing "feel" that you like. At the easiest (lightest) setting, the focuser moves extremely smoothly. At tighter settings, you can still use heavier accessories without sacrificing much of the smooth focuser action. GSO's rated load capacity for their Crayford focusers is about 6 lbs (2.7 kgs). These focusers are rotatable, i.e., you can turn the entire focuser body/diagonal/eyepiece combination into a better observing position by loosening or tightening a large silver thumbscrew on the top of the focuser. However, please note that this is a relatively weak feature of this otherwise excellent product. We inspect every single focuser and tweak/lube it as much as we can, but the rotation is often not smooth over the entire 360-degrees and may bind in a few spots, requiring additional effort to rotate it. This is probably a minor annoyance since most people will not use this feature very often. The focuser is easily attached to a telescope tube with three M4 screws (not included) spaced 120 degrees apart on the flange. Installation is usually a 5 minute job that involves removing your old focuser, sliding in the new Crayford focuser, and screwing it on to the telescope tube. In almost all cases, the original screws used on your OEM focuser will also work for this Crayford focuser. If not, you will have to buy the M4 screws from a local hardware store. You will just need a Philips (cross-slot) screw-driver to perform this upgrade. We strongly recommend that you make sure that you can remove your old focuser from your telescope tube before buying this item. Some OEM R&P focusers can be very hard to remove. The focuser comes with an 86.4mm (3.40") base plate adapter. Click here for a telescope compatibility table to see which focuser might work for you. Click here to see photos of Crayford focuser installations on various telescopes. If the basic focuser size (86.4mm) does not fit your telescope, we also sell some other adapters that can be used to connect this focuser to several telescope models from Antares, Meade, Celestron, and others. Adapters for the popular Celestron 80ED and 100ED refractors are also available. Most Crayford focuser units are shorter than existing R&P focusers. So while you will typically have more in-focus travel with a new Crayford focuser (which is great for imaging applications), you might not have sufficient out-focus travel to reach focus with all your eyepieces/accessories. In such cases, the problem can be easily fixed with 2" extension tubes that are available separately. In many existing focusers, the base for your finder bracket is molded onto the focuser body. When you replace the existing focuser with a Crayford focuser, you will lose this base to mount your finder. Please note: Most GSO Crayford focusers have or will soon develop two bearing marks/lines on the upper side of the drawtube. This is caused by wear on the barrel anodizing where is makes contact with the roller bearings. In some focusers, you have to look hard to find these marks. In others, it is very prominent, even for brand new items received from GSO. This does not indicate a defective or used product and is essentially just cosmetic. 4.8 (Based on 66 Reviews) 100% of reviewers recommended this product. Installed in 5 mins on my old 100 dollar Orion Short Tube 80. This old scope always was a little "off" when looking at stars. I thought it was because it was a cheap scope. After mounting this focuser onto the scope, the stars and star test were much, much better. Very surprised. It was the cheap focuser that came with scope that was the problem. Now I feel like I have a pretty decent scope with only 250 bucks total into it. This new focuser is very smooth and the dual speed was well worth the extra money. Very glad I bought this. Now I don't dream so much about an expensive scope. This set up is good enough. The focuser looks and operates like it should be on an expensive scope. This focuser screams quality at you when you open up the box that it ships in. It's a heavy, well machined piece of metal. I installed it on a Meade Adventure Scope 80. Installation was easy as Mom's apple pie. Fit and finish are excellent. You haven't really lived astronomically until you use the fine focus utility on a focuser. Discard all of your cheap cast rack and pinion focusers for one of these. I'm not only sold on these 2 speed Crayford Style focusers, but, now I'm spoiled! My other telescopes I now look at, as handicapped! And Astro Agena gives excellent after purchase service also. Perfect upgrade for any of the 80mm long tube refractors. Exact match to original mounting holes using the 86mm adapter. This the best focuser I have ever used. I find this focuser to be well made and free of any play or backlash. It's very smooth and the adjustments are helpful to get the right feel. The price is very reasonable and to me that is a factor. Glad I got the dual speed focuser. It was well worth the money. My Orion Short tube 80 finally has a good star test. I have been observing for 15 years. Never used a crayford focuser. Bought this for my 15 year old Short Tube 80. Installed this very nice looking focuser in 4 minutes. Incredible. Should have done this a long time ago. Stargazing just became a different experience. Very glad I sprang for the dual speed. That's most of the experience. The fine, smooth focus down to a beautiful airy disc. No more image shift, at all. It made my scope feel brand new and improved the quality of the star test. My stars look like little suns now. Best 137 dollars I ever spent. I bought this to upgrade my ST80. It doubled the cost of my set up but allows me to use 2-inch eyepieces. The first thing I noticed is that it looks way nicer that the stock rack and pinion focuser. At first use, the difference is amazing! Buttery smooth focus and fine focus were flawless. I really like my new GSO Focuser. It does the job, and does it well. I certainly would recommend it to anyone wishing to upgrade. I put this on my Orion ShortTube 80 (purchased in early 2017) and it fit just as Agena Astro's website noted. It is solidly constructed and all the movements are smooth. I actually dropped my telescope from about 4 feet off the ground. The telescope slipped off my GEM and fell on the blacktop in my driveway at night. My telescope was undamaged because it landed on the focuser. Three of the set screws were bent out of shape, and the fine focuser knob was also bent. I bent the fine focuser knob back to its original place and replaced the screw on the 1.25" adapter. This screw was the only one that broke. I replaced the other screws because they were bent. I had lots of spare parts lying around. Well, the focuser works just as well as it did before the fall. As for the telescope, it didn't go out of collimation because the lenses are set in and not loose. The focuser took a beating and saved my scope from the impact. Seriously, this is a well-made focuser. Wow a high quality product! 2" GSO Focuser fits Orion ST80. Very pleased. This was my second attempt to get a focuser to work on ST80. I bough this to replace the cheap focuser on my Orion ST80 Autoguider scope. Great improvement over the stock focuser, definitely recommend this. The draw tube will move of its own accord if there is too much weight attached. To avoid this, there is a locking screw but it will defeat the focus knobs. As a manual focuser, these difficulties can be countered. For me it solves the problem of image shift and there is no discernible backlash. It attached snugly and securely to my OTA. It has a rotation collar that holds position and operates smoothly. So easy and such a difference to be able to use 2 inch oculars with an ST-80! Smooth function, secure holding, rotatable, lockable focus—everything I could want and a very reasonable price in my opinion. I purchased this to replace the focuser on a Meade 80mm travel scope. It fits perfectly and has a smooth focusing action. Bought this to update an old ST80 short tube for the eclipse. My Hershel Wedge needed a 2" focuser. The new focuser took all of about two minutes to install. It is a sturdy, well made product. It turned what was a toy of a telescope into a real working instrument. That scope with the Hershel on it was the hit of the public viewing party. I got this to replace the 1 1/4 focus inch assembly on the ST80. It fits the telescope perfectly and provides a 2 inch, two speed focus mechanism that performs very well. The friction adjustment and focus lock both work very well. I don't use the camera rotation function, as I'm not confident the accurate focus is maintained. It is a cost effective solution to my needs. The difference is like fishing with a Zebco and then moving up to a Penn Fathom; steppin' on up! I bought one of these fine focusers elsewhere since Agena was sold out (go figure). The difference in focusing from my scope's stock focuser is like night & day! This, coupled with a GSO 8x50 finder scope (bought at Agena) has reignited my interest in losing sleep in the wee hours! Thanks Agena! My only criticism is with the two thumb screws underneath the focuser barrel. I can't determine what one of them does. I have discovered that one does indeed lock the focuser so that it cannot be moved in and out, but what the other one does I can't figure out. The one on top of the barrel is the rotational lock and it allows the barrel to be rotated, which I do use quite a lot since I use that refractor on an Equatorial Mount and the scope gets a lot of rotation in certain configurations. 5.0 Orion ShortTube 80-A Perfect fit. Works perfectly with my Orion ShortTube 80-A Refractor. The three screw holes are a perfect fit. Installs in about 2-3 minutes. So far works great with my 1.25 and 2 inch eyepieces. Drawtube length just right when used with diagonal mirrors. Had to add extension only when I attached camera directly to tube without mirror. I replaced the stock single speed R&P focuser in my several years old Orion ST-80A . . . and what a difference! While the stock focuser is certainly serviceable, I found myself constantly doing the back and forth yo-yo trying to find that focus sweet spot. This GSO dual-speed instantly eliminated this dance, providing fast, efficient and precise focus. Fit and finish are, as per usual for GSO products, excellent, the mechanics outstanding. Just an overall well made product, a substantial piece of kit. Installation was, as others have said, 3 screws out, remove stock focuser, install GSO dual-speed, 3 screws in. Done. This fits perfectly into the OTA of a Skywatcher Evostar 90. Admittedly this focuser is about the same price as the entire telescope, but it turns a great grab and go scope into something that is an absolute joy to use, as well as now allowing use of 2" eye pieces. 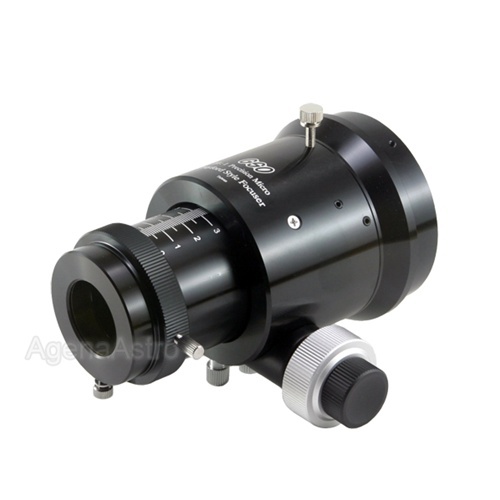 this focuser is an excellent upgrade to your telescope, it has a feather touch operation .high quality cnc machined aluminum with roller bearings and you can attach a finderscope to it with an optional bracket. Fine focusing makes a huge difference. This two speed crayford design fits my ST80 to a 'T'. This light weight fast archromat is a good scope now a very very good scope. I can have some apos to compare it with having dual speed focusers, this GSO focuser is a great investment for improving an achromat's performance with it features. I purchased this focuser to replace the rack and pinion focuser on an Orion ST80 refractor. This solid, well made focuser actually turned the ST80 into a better scope, making it much easier to get a sharp focus. Motion is very smooth with no play or backlash. The entire focuser feels very well made. Nothing flimsy here. Installation was quick and easy: three screws out, three screws in. The rotating collar is a great addition, especially if the scope is used on an equatorial mount. I also like the screw holes for adding a finder mounting shoe either on the left or right side or both. Review by Mike of Oklahoma City, OK. I have two Celestron (Synta) refractors: an f/7.5 80 mm ED and a f/11 90 mm. Both came with rack and pinion focusers that were less than ideal. I replaced the one on the 80 mm several years ago and it worked great. I recently replaced the one on the 90 mm and, surprisingly, it took the same size GSO focuser. The process of replacing the original with the GSO focusers is easy and straight forward, the instructions are clear and accurate. I am very satisfied. Review by AtomB of Phoenix, AZ. I bought this to replace the stock rack and pinion focuser on my C80ED (requires adapter). It is nicely machined and anodized. It is quite sensitive to drawtube tension, but I'm starting to prefer it this way. A nice feature is the graduated index marks on the drawtube, so you can better estimate the distance to focal plane when setting up the scope. I especially like the fact that the finder base (not included) is mounted on the part of the focuser that rotates, so that you can maintain the finder and diagonal in the most comfortable orientation, no matter which direction the scope is pointed when mounted to an equatorial mount. Review by Vit of Russia, Perm' town. Review by Which star is that? of UK. Good, solid focuser that was easy to fit. Friction adjustment is a bit fiddly and needs setting when using heavy lenses or an SLR, but that is the way with Crayford focusers I suppose. No finder dovetail or adaptor is included and my original 'scope had the finder on the focuser, so I had to adapt one of the Agena Synta dovetail bases to fit, but Agena were very helpful with this. Review by South Shore Stargazer of NY State. Product is installed on an Orion Astroview 90 EQ as a replacement for the stock Synta rack and pinion focuser. The GSO is the focuser this scope should come with in the first place. For visual use, it's best value for money I've seen. After using it for a while and enjoying the smooth accurate focusing it provides, I am glad I invested in this product. Review by Ed in Houston of Houston, Texas. I purchased a Meade 90mm f/8.8 tube assembly refractor on ebay for $37. As it turned out the optics were diffraction limited but the focuser was barely useable. Needless to say the 90mm was just begging for a finely machined focuser to go with it's great optics. The Meade tube had an inside diameter of 89mm. The GSO came with a 86.4mm adapter and it fit nicely into the Meade tube with no shims needed. Now I have a diffraction limted refractor with an excellent focuser. Thanks for the great product. Review by IslipPCTech of Islip, NY. Fantastic focuser. Light years ahead of the stock focuser for my Orion Astroview 90 EQ telescope. Installation was a cinch and it works so much more smoothly now. I can use 2" eyepieces now and I bought the adapter to mount my 6x30 angled finders cope. Two small gotchas. The focuser adds more than 1 1/2 pounds of weight to the OTA. My tube now tips the scale at 7 pounds which is pushing the limits of the EQ-2 mount I use. Also needed to rebalance the scope in both RA and declination. Other gotcha is the scope is mounted forward in its tube rings to accommodate the additional weight. Regardless - it's an impressive product. Thanks. Review by Geoff M of Tahoe, CA. Good dual speed focuser. This focuser and the available GSO finder bracket and red dot finder made a great upgrade on my old Taiwan-made Meade achro. I wish it rotated 360 degrees without hanging up a bit in spots (as stated in the literature), but for the price, this is a solid value. Review by Jean-marc of Nantes, France. I order this focuser to use it with an homemade refractor OTA 6"F10. I am very satisfied of it for the price. Just the rotation of the focuser is a bit hard when it hold heavy binoviewer. However I am very happy. Review by CoosmicLugNut of SW Indiana. The drawtube on the GSO Crayford Focuser for Refractors - Dual Speed (with 86.4mm Telescope Adapter) and compression ring visual back are machined from solid aluminum and affords smooth operation, great feel and precise adjustability. Internal baffling and anti-reflection blackening increases contrast and decreases ambient light reflections. The dual speed affords precise and accurate focus control. The GSO Refractor Crayford Focuser mounted directly to my Orion ST80 with the same screws that held the OEM focuser on the optical tube with no hassles whatsoever. Precision machining and smooth operation make thuis one of the best value focusers on the market today. Review by Sergio Castillo of Inglewood, California. I purchase this GSO focuser a while back. To replace the stock focuser on a 80mm refractor I bought for guiding. This focuser provided me with the best stability on my camera equipment. Focusing on targets was easy with the double speed performance of this product. I had no problem using most of my eyepieces and most important my cameras. I had done lots of imaging with this GSO crayford focuser and believe me I highly recommend this focuser as a great way to upgrade your scopes stock focuser. Review by Oz of Hopkinsville, KY.
Super easy to install, just three screws that I reused. Took all of thirty seconds to turn my mediocre ST80 into an impressive instrument. Much much better than that stock rack and pinion. Now I can precisely focus in on that sweet spot and push the little refractor to its limits and it performs. Yeah it doubled my investment and more than tripled the scopes performance. Has more focus travel than the stock focuser as well. Well worth the investment. Review by Roger of Maryland. Be sure to tighten appropriately when pointing towards zenith! Review by Steve of Sidney, ME. I purchased this as a replacement for the stock rack and pinion focuser on my little Synta-made ST80 refractor. The focuser itself has quite a bit more mass than the rack and pinion did, lending a nice, solid feel. The new focuser was easy to install, with the screw-holes lining up perfectly. Much easier to use than the original focuser on my scope, with no backlash. It did take some fine tuning of the tension to keep from going out of focus when observing near the zenith. Review by exwizard of Londonderry, NH. I bought the focuser as an upgrade for my Orion ST80 refractor. It was a perfect fit and it only required about five minutes to remove the old rack and pinion and install the Crayford. The focusing motion is now very smooth and backlash free. The ST80 normally functions as my guide scope for an 8 inch Meade LX200GPS. With the addition of the Crayford focuser I have also been able to use its short focal length for wide field LRGB imaging with my Atik 314L+. The focuser has no problem with the weight of the camera and filter wheel. Since the lens of the ST80 is only an acromat I expected that I would have to refocus for each filter and perfection, of course, demands that this be done. I find, however, that it is usually adequate to focus precisely for luminance and then to use a calibration of the fine focus knob to make the small changes for the color filters. The only unavoidable limitation for this use is that the achromat does have trouble with violet wavelengths so adding a minus violet filter or a skyglow filter can be helpful when imaging bright blue objects. Review by heliman41 of Valparaiso IN. 4.0 Well crafted & has nice finish. For the price its one of the best dual speed crayfords out. The fit to my OTA was a precision snug slip in & the holes matched. Great improvement over the rack & pinion my refractor had & this focuser has no play/slop. Only thing I notice which is no big deal is that when using heavy large eyepieces at zenith I have to lock the focuser screw down or the focuser may slip a bit. Not an issue once the OTA has come to ambient temp & no longer needs focuser tweaking now & then. Its a LOT of finely machined alu for the price & a super focuser upgrade if you have a synta refractor or a SCT or Mak with mirror slop. Review by JCBC of Kentwood, MI. Great replacement for my Orion 80mm Short Tube, no adapters required, straight fit. Review by Kevin of Indiana. I bought this for use on my C80 ED. Got the adapter ring with it of course. What a huge upgrade. I love using this focuser! I always have this one in mind when thinking of buying different scopes, I wouldnt hesitate to buy another. Review by telescope tom of Tucson AZ. Nice and light weight, works good. Review by Jimmy of Boiling Springs, SC. I bought this focuser to upgrade my Short Tube 80mm refractor's rack and pinion 1.25" focuser. The upgrade took only a couple of minutes and the three screw holes matched perfectly. This focuser is a joy to use holding my heavy 2" eyepieces, as well as, my binoviewers. I highly recommend this item for a beautiful upgrade to these terrific little scopes. Review by Wade of NW Illinois. The focuser is great, too! :-) Buttery smooth and solid as a rock. Review by Coco of United Kingdom. This focuser can easily micro focus my 314L+ & Filter wheel or EOS 40D & Focus reducer at the meridian without slippage or creeping. Once focused its not necessary to really over tighten the focus lock grub screw that much because it's is that good. The best thing about the focuser is its internal bearings, they run on both sides of the draw tube and hold up nicely eliminating flexure. I bought the micro 10:1 type but regularly don't bother using micro and just use the main focus knobs there that good. Review by Deneb of London, UK. The adaptor is a breeze to fit, the build quality is excellent. Review by Aragorn of Denver, CO.
We should have upgraded the focuser on our Celestron C80ED long ago. This is the perfect focuser for it. The dual-speed controls and smooth motions are just what we needed. 5.0 Sweet focuser for low cost! I bought this focuser for a home-built short focal length refractor. I needed a large focus tube to take full advantage of the short steep light cone from the objective. This big beautiful focuser works great! The focusing is like butter, and is adjustable in tension, and lockable. The whole focuser can easily spin around to suit the orientation of your telescope. It has an ample focus range of 80mm (3 1/8"). The focuser tube is sized for 2" eyepieces, but it comes with a 1.25" adapter, both of which have big thumbscrews and brass compression sleeves. My only qualm is that the whole thing has a nice glossy black anodize finish, which looks great on the outside, but is not so great on the inside. The focuser tube IS threaded (micro-baffles) which cuts most of the reflections, but the glossiness of the finish still reflects some. I ended up masking it off and painting the inside of the focuser tube and inside of the focuser body with flat black paint. Now its a black hole on the inside...sweet. This is the third GSO Crayford style focuser that I have purchased from Agena and as always I am not disappointed. There is no better value for the dollar than this focuser and really no better upgrade that you can do to your scope. Its fit, finish, and functionality rival even some of the other custom focusers on the market. Whether it is an entry level scope or a high end professional scope, this focuser will bring something very good to the table. Review by BradleyB of Olympia, WA. I bought this focuser to replace the original unit on my C80ED scope. It is a far superior focuser to the original one. This is a nice looking focuser with a smooth machined finish with even black anodizing. The action of both the coarse and fine focus is good. The tension adjustment is pretty sensitive to get good action and still have adequate holding power. If the tension is too loose, the tube slides out when the scope is pointed high, and if it's too tight the fine adjustment slips instead of focusing. With a little finesse it can be adjusted just right. I also found that in cold conditions it needs to be adjusted slightly tighter, but this is very easily done even with gloves on. There is a rotating feature, where the angle of the focuser can be changed as the telescope changes angle, useful for use on an equatorial mount. It is a somewhat loose fitting mechanism, such that when the set screw is loosened to rotate it, the focuser flops around a mm or two. Once positioned and retightened however, it seems to maintain alignment just fine. The best part of this focuser is its ability to get very fine focus with no backlash, which is what is considered the main feature of a two speed crayford focuser in the first place. Review by elmiko of Arizona. Ordered the dual speed Crayford for my Orion ST 90 refractor. It works great! It was easy to install, using same three scews. Collimation was improved also, because of build quality apparently. Turned my [$] scope into $900 one! It was a pleasure doing business with you folks. Will definitely use you again for other astronomy accessories. Review by Q of Medford, Oregon. with its ability to rotate. It is mounted on a 12.5 inch Dall Kirkham with a truss tube. I machined the tube and all of the components for the scope and this focuser nicely complements the instrument. Review by [...] of Cibolo, TX. 5.0 Exactly what I was looking for! Okay, here's my story. Back in the late 90's, I purchased a Coulter 90mm short-tube refractor for use at public outreach events. My 10" Meade LX50 got to be such a chore to setup, and then take down again, that I started a search for a scope that was much lighter, and more transportable. My budget was VERY low, so the Coulter short-tube refractor (with alt/az mount and tripod) was what I ended up bringing home. Fast forward 10 years. The LX50 has long since been replaced by a downsized, yet computerized, 8" Meade LX200GPS, and the short-tube had been relegated to sitting in the corner of the room collecting dust. However, as of late, even the 8" SCT has become a chore. That's what happens as you get older! At any rate, I was once again looking to purchase a scope that was more "anti-backache" than the 8" SCT. After a lengthy search, I finally decided that it just might be time for me to think about simply upgrading the short-tube refractor. There were two things which needed upgrading - the mount/tripod and the focuser (Yes, we're finally getting to the focuser review). The focuser ended up being the first phase of the upgrade project. My focuser requirements were simple: I needed the capability to utilize my 2" eyepieces, dual-speed Crayford-style focusing, and a price that wouldn't break the bank. Boy, did I underestimate how hard a task it would be. Everything I could find on the Internet was in the realm of several hundred dollars! I was about to give up on my upgrade project, when a GOOGLE search produced a link to the AgenaAstro Products website. Lo and behold, there was the focuser of my dreams. Though it was initially hard for me to determine exactly which model would fit my refractor, the website offered images of other scopes which had used the company's focusers as upgrades. Luckily, there were at least two separate scopes that looked exactly like mine, and they were both upgraded with the same focuser. So, I was able to determine which GSO focuser model I needed.Though I had never heard of the brand before, and was a little apprehensive about making the purchase, the GSO 2" dual-speed focuser addressed every single one of my requirements, and an additional requirement that I hadn't even realized I needed. My eventual mount/tripod upgrade was one which utilized a "side mount" configuration. Therefore, I realized I had lucked out when I finally became aware that I needed a focuser that could also rotate at least 90-degrees. Installation for my particular focuser model was a breeze! Simply remove the 3 mounting screws from the old focuser, remove and replace with the new focuser, and reinsert the 3 mounting screws. Piece of cake! To the company's credit, they readily acknowledged a minor shortcoming to the GSO refractor focusers. It seems that manufacturing tolerances may not have been as strict as they should be, concerning the rotatable mounting collar. They indicated that users may experience some stickiness at certain points during a full 360-degree rotation of the collar. This was especially true of my particular unit. However, it is not an issue with me, as I do not foresee the need for me to continually rotate the focuser. I currently have it in the 90-degree offset needed for my application, and there it will stay.The fit and finish of the unit is on par with some of the more expensive units I've seen, and is well machined. The focusing mechanism is extremely smooth, and responsive. The thumbscrews for the focus lock, and focus tension, are logically placed and readily accessible. The graduated scale etched (and highlighted) into the drawtube is very handy, as it allows for quick and accurate refocusing when changing eyepieces. Overall, I am EXTREMELY pleased with my focuser purchase! Review by Stefano from Italy of Modena, Italy. Sorry for my english (I'm Italian ), the focuser GSO is very ok, and each components of micro regulation (focus ). Review by Fishonkevin of Michigan. The dual-speed is just one of the pluses of these focusers. The gradiated drawtube is very handy for repeating focus while doing astrophotography, and the rotation makes for an easy night on the neck (not to mention framing a picture). But the best thing is the tensioner and lock screws which prevent heavy accessories from causing the drawtube to slip and lose focus over time. Review by rcole_sooner of Norman, OK. This has been a fantastic upgrade for my C80ED. It makes focusing a breeze. It supports my Canon 40D and provides stable images. If you have a scope like the C80ED with a stock focuser, stop waiting and upgrade to this focuser. Review by Stargazer of Michigan. When I purchased a C80ED, I didn't plan on putting any more money into it. I just intended to use it out of the box, as is. The optics turned out to be great but I was getting a little frustrated with the rack and pinion focuser. I cleaned the heavy grease from it and re-lubricated it. This helped some but the more I used it, the more I disliked the image shift and somewhat jerky feeling when focusing...especially at higher powers. it was time to take a closer look at a Crayford-style focuser for this fine little refractor. Agena Astro has a relatively low cost GSO dual speed crayford and when they provided an adapter, specifically for the C80ED, I decided to go for it. Removing the old rack-and-pinion focuser is somewhat of a chore on the C80ED but getting a good grasp on the OTA is the key. I ended up placing the OTA vertically, with the objective end up (covered of course), and the focuser end in a vise. I used a soft-jawed vise and wrapped the OTA in a towel. Being careful not to over-tighten the vise, I could now get a firm grip, with both hands, to unscrew the OTA from the focuser. Installing the new GSO crayford focuser and adapter ring was a breeze. I think it took me all of about 2 minutes. The improvement to the telescope is outstanding! The focuser is now as smooth as butter, no image shift, and the fine micro adjustment gets you right where you want to be. I also bought the optional finder bracket for a few bucks more and plan on adapting my Rigel QuikFinder to it. The GSO Dual-Speed Crayford Focuser is a fine addition to any telescope and will only add to the value. Review by dfrybarger of San Francisco, CA. I just received a GSO crayford focuser from Agena Astro and this piece is an incredible bargain. It was [$] shipped (which includes an adapter and tax because I'm in California) and the workmanship is first class. My Celestron 100ED looks super sharp with this focuser and collimation is dead-perfect at every angle. I ordered another one today for my Celestron 80ED. And also I have to say that Agena Astro (agenaastro.com) gives top-flight service every step of the way. Emails are answered within hours and I ordered this piece on Sunday and had it within 72 hours. They have made me a loyal, repeat customer.